I am glad to finally be back! I fell sick along with my boys this past weekend and really did not have anytime to work on any printables. These icon stickers have been a work in progress for forever and I am finally happy to share it with you all. All icons were found on iconfinder.com and were free for commercial use even though I'm not selling. 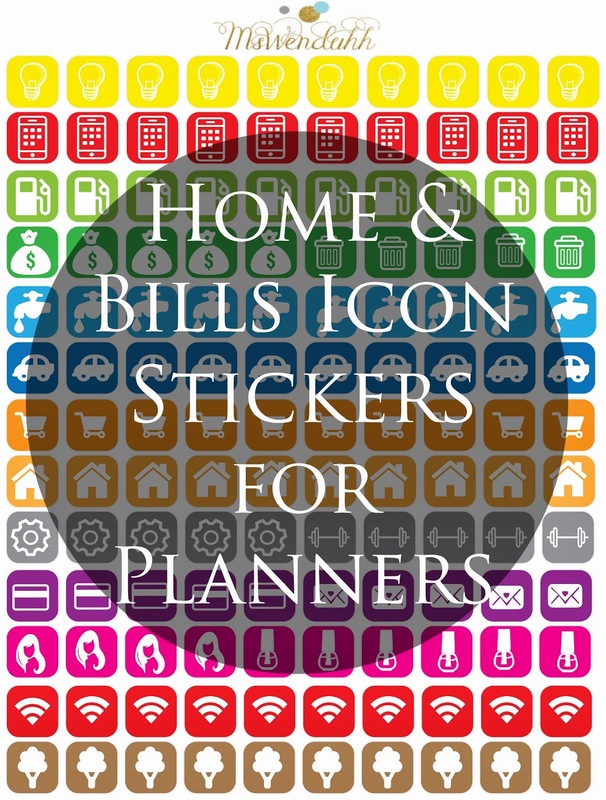 I just created a nice rounded square backgrounds and colors to these icons and thought they'd be perfect for our planners. You can use these for bills, reminders, etc. So I hope that helped you in some way of how to use these stickers in your planner I think I made them the perfect size. As you can see they can be used for more than just bills! I hope you like these stickers, let me know below if you would like to see more like this! & How to Make Kiss Cut Stickers Without a Machine! At the risk of sounding like a calendar/organizing idiot (but guilty of being a true beginner) how do I print these to become stickers? Do I need the sticker machine from the craft store, just print and use adhesive? Love all your downlloads, I just wasn't sure what to do with them. Thank you ;) make sure you get your rest! Thank you so much, this is exactly what I was looking for!